He was attempting to embody the myth of the lone savior, called forth, as always, by the unprovoked attack of pure evil. This ground had been well prepared. Dozens of action/disaster films had culminated in two films – Independence Day (1996) and Air Force One (1997) – in which American presidents personally piloted jet planes, killed villains and saved the entire world. 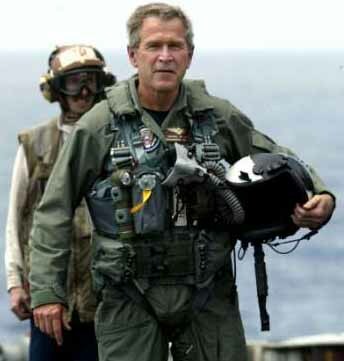 In 2003 Bush’s handlers certainly had this mythic background in mind when they had him (appear to) land a plane on an aircraft carrier https://madnessatthegates.files.wordpress.com/2017/12/2009-10-22.jpg?w=143&h=150 143w, https://madnessatthegates.files.wordpress.com/2017/12/2009-10-22.jp... 286w, https://madnessatthegates.files.wordpress.com/2017/12/2009-10-22.jpg 344w" sizes="(max-width: 187px) 100vw, 187px" style="background-color: transparent; border: 0px; margin: 4px 0px 12px 24px; padding: 0px; vertical-align: baseline; display: inline; float: right; background-xg-p: initial initial; background-repeat: initial initial;" width="187" height="197" /> and proclaim, “mission accomplished” in Iraq. Nearly fifteen years later, of course, no one can pretend to know what that ongoing “mission” is. Thus Bush combined the image of the lone savior with another one: the unsophisticated country boy – Parcival – who comes to the city, competes with the effete intellectuals and succeeds by tweaking their noses. In America, this pattern goes back at least as far as Davy Crockett. But Bush, of course, was no Indian killer; his famous smirk was the passive-aggressive gesture that adolescents make while enduring Mom’s lectures on proper behavior. https://madnessatthegates.files.wordpress.com/2017/12/795fc0169ab7e0dea3d3279de0ded754-george-w-bush-quotes-ridiculous-quotes.jpg?w=570&h=406 570w, https://madnessatthegates.files.wordpress.com/2017/12/795fc0169ab7e... 150w, https://madnessatthegates.files.wordpress.com/2017/12/795fc0169ab7e... 300w" sizes="(max-width: 285px) 100vw, 285px" style="background-color: transparent; border: 0px; margin: 4px 24px 12px 0px; padding: 0px; vertical-align: baseline; display: inline; float: left; background-xg-p: initial initial; background-repeat: initial initial;" width="258" height="184" /> Ultimately, with the War on Terror temporarily propping up his poll numbers, perhaps he was so persuasive because, like Reagan, he played himself – a grandiose, uninitiated male, alternating between hero and clown. Queue Trump for the third time. However, he was also a celebrity, and he knew his audience. Trump and his handlers learned well from Reagan and Bush, https://madnessatthegates.files.wordpress.com/2017/12/170915174518-trump-marks-pow-day-super-tease.jpg?w=576&h=324 576w, https://madnessatthegates.files.wordpress.com/2017/12/170915174518-... 150w, https://madnessatthegates.files.wordpress.com/2017/12/170915174518-... 300w" sizes="(max-width: 289px) 100vw, 289px" style="background-color: transparent; border: 0px; margin: 4px 24px 12px 0px; padding: 0px; vertical-align: baseline; display: inline; float: left; background-xg-p: initial initial; background-repeat: initial initial;" width="275" height="154" /> as well as from American mythology, which prioritizes identity in terms of the racialized Other. Although he couldn’t claim to be a traditional outsider from a western state, he converted the mainstream media in the eyes of a third of the country into the hated insiders that his followers perceived as the source of their misery.